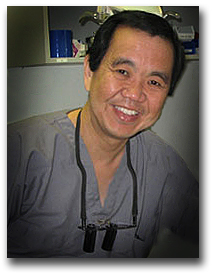 Dr. James Lee has been practicing dentistry in San Antonio, Texas since 1980. A native of San Antonio, Dr. Lee attended University of Texas at Austin where he received his Bachelor of Science degree with Honors in Mechanical Engineering, after which, he worked as a product design engineer at IBM for two years. Dr. Lee then returned to San Antonio to study dentistry at the University of Texas Health Science Center, where he received his degree as a Doctor of Dental Surgery. Both he and his staff have extensive post graduate studies in all fields of General Dentistry, including TMJ therapy, Orthodontics, Endodontics (Root Canal Therapy) Cosmetic and Esthetic Dentistry, Pediatric Dentistry, Laser Periodontal treatment (care for gums and bone around the teeth), and Patient Centered Care, all targeted to better serve his patients. Dr. Lee was born in San Antonio and is a son of Chinese immigrants. He is married and has three children. He devotes much of his time to his ongoing education in the dental field. Dr. Lee is a member of the American Dental Association, Academy of Laser Dentistry, the Academy of GP Orthodontics, the American Academy of General Dentisty, the Texas Dental Association and the San Antonio District Dental Society. He did post graduate study at the Pankey Institute for Advanced Dental Education and was an Assistant Professor of Clinical Dentistry for ten years at the University of Texas Dental School at San Antonio.